World-class cuisine with local hospitality… Try it! Xperience Kiroseiz Parkland offers an array of elegant buffet and specialty restaurants to indulge in your choice of Western and Oriental delicacies, as well as six stylish bars to enjoy exotic cocktails and light snacks throughout the day. Combining French quality with German quantities, the Belgian cuisine offers a variety of national delicacies to suit all tastes. Select from a wide range of specialty dishes ranging from fresh mussels with fries, Belgium’s good old fashioned cream eggs and meat stew, while enjoying fine wines and rich Belgian beer served against a cozy pool view. Take a unique culinary tour of Italy at Dolce Vita, where Italian tradition and modernity are expressed with highest quality. With enormous windows overlooking lush landscaped gardens, you will savour the finest in Italian cuisine: from handmade pasta and different risotto dishes to fresh seafood and cured meats. Top it off with a strong Italian Chianti, while taking in the green soothing surroundings. Set against a magical backdrop of soothing waterfalls under Sinai’s starlit sky, Bukhara takes Indian cuisine to a whole new level. With Chef Balak on board, innovative masterpiece dishes rich in authentic spices and Indian flavours will surely tickle your taste buds, while the ‘Taj Mahal’ ambience will send you on an Indian journey. 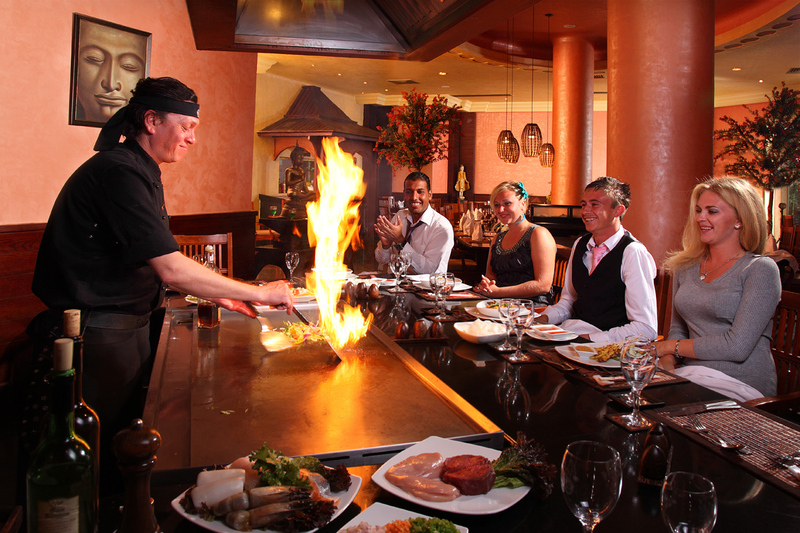 Enter into Sumui Island’s exotic world to experience Asian cuisine at its finest. From fresh Sushi to tasty Tepanyakki, Sumui Island offers a great dining experience involving all the senses in a chic and warm ambience. Live show cooking takes place every night to delight the whole family, guaranteeing a memorable culinary discovery. Local colors come to life as you step into our chill out corner 'L'Oriental'. Live a tranquilizing, local experience as you sample "Shisha" flavours and local appetizing mezzas while lazing under a starry sky. Capturing local spirit in ambience, hospitality and delicious national specialties, Sultan offers a memorable oriental experience like no other. Our open buffet allows you to choose from a wide variety of typical Egyptian dishes such as Kebab, Foul and Falafel. Enjoy a grand culinary highlight as you dine in Pharaonic splendour. Designed like an ancient temple featuring humongous columns, Pharaoh’s unique and spacious ambience revives your appetite as you indulge in a variety of open buffet specialties. With comfortable red leather seats and a cozy dim lit ambience, Waves Bar is the perfect retreat to sip on refreshing cocktails after a long day in the sun and chill out with your loved ones, while feasting on a fine selection of wines and other beverages.